Charles Dutoit is an old fashioned sort of conductor, in a good way I mean, he's somebody who pays attention to details and makes sure he gets the most from his musicians. And unlike some his his younger colleagues, he is not a conductor who strives for excitement at the expense of every other musical virtue. He can usually deliver the excitement as well, but when the energy drops, as it occasionally does on this disc, we are left admiring the high quality of the orchestral playing but in something of a musical vacuum. The first movement suffers this the most. All the notes are there, and it isn't particularly slow. But there is a lack drive in many of the passages. All of the abrupt tempo changes are perfectly executed, but there is rarely much enthusiasm for the follow-on section when it has been established. The second movement too could do with a bit more oomph. Admittedly, Rimsky-Korsakov doesn't really write this as a high energy scherzo, but it could still do with a little more zest than here. That apart, this is a good recording. The energy certainly picks up in the finale, and I've no complaints at all about the Russian Easter Festival Overture. The RPO play well, although they are not quite managing the same top standards as other London orchestras at the moment. The string sound is a little course, and the tuning in brass often leaves much to be desired. On the other hand, the woodwind section puts in an excellent performance, with real character to their various solos and ensembles. I sense a tension between the violin soloist Clio Gould and Dutoit. All the violin solos are interpreted very freely, with lashings of rubato and some wonderfully distinctive phrase shaping. But then the orchestra comes in and everything immediately settles down to an even conformity. They evidently have different ideas about the piece, and the violin solos often sound like they have been transplanted from somewhere else. That's not necessarily a fault, in fact it fits quite neatly into the narrative, with the wilful Scheherazade getting her own way, and achieving independence (or at least survival) on her own terms. The sound quality is good. There is detail in the orchestral sound, although this being RK there could always be room for more. The packaging includes three different photographs of the orchestra playing at the Festival Hall, which is somewhat deceptive given that this recording was made at the Henry Wood Hall. But the acoustic there is better anyway, and it certainly benefits the audio. 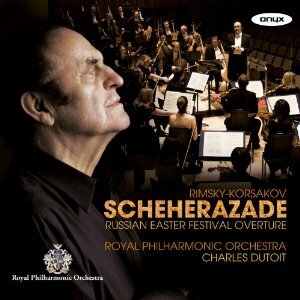 So, a good Scheherazade and an excellent Russian Easter Festival. This is not quite vintage Dutoit, but it is a recording that benefits from his many years of experience. As I mentioned, he is a conductor who really knows how to get the best out of an orchestra, and his continuing association with the RPO can only work in their favour. My only real objection is that the first movement in particular is a bit limp, but the later movements of the symphony and the overture at the end are all magnificent.